We’ve gutted our bathroom. 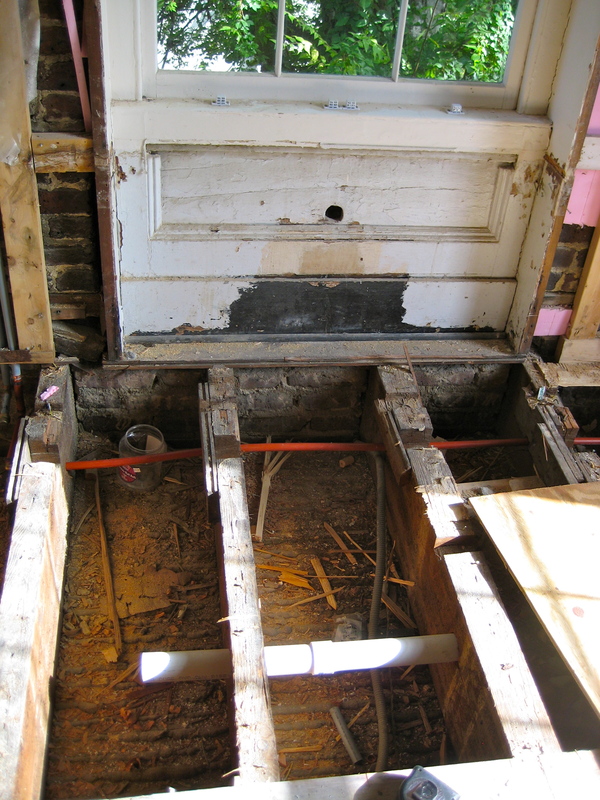 It’s an old house, and peering under the floor boards may happen once a century. Still, we were a little surprised to find, down between those old joists, going strong, an entire electrical city of knob and tube wiring. Knob and tube went out in the 1930‘s; but it was built to last. The insulating sleeves that protect the heat transfers, I learned, are made from a cloth called loom. Little cozies for the electrical tea pot brewing up light. How could a weaver not love that? I became charmed by the circuitry that lit up this grand dame of a house for almost 100 years without ever showing her age. Still, after much back and forth, we realized it had to go. A whole new integrated circuit was called for. This was more than just cleaning out arteries, improving circulation. It was like getting my life re-wired. I’ve come to a moment in time, here in the ripeness of mid-life, when I’ve had to pull up the floor I’m standing on and look underneath. It’s humbling to see how my interior has been wired up until now, and then realize that the whole foundation I’ve come to depend on is outmoded. It’s got to go. Life, if anything, feeds on change; and change is that demanding. It can take away everything under your feet. The people I love. The thinking that keeps me safe. The routines that run along familiar, but antiquated lines. Even the person I thought myself to be. One day when I was not around, Aaron and his crew shut down the circuit, took the heat from the old loom, and yanked it all out. A whole new pipeline of juice went in before I returned, and new flooring was cut and laid on top of it. I’m newly powered, ready or not. This morning, I sit on my porch in the dark and watch the day arrive. I feel the absence of the daughter I used to be, the minister I once was, the wife I felt I should be. Gone. Slowly, my senses plug into new presences. A dark splash in the fountain. The glittering crown of a live oak. The sound of life, shifting its weight. One day soon, I will walk gingerly onto new floorboards in the most intimate of rooms, and I will finally flip the switch. Imagine my surprise, when everything lights up mysteriously from below, and I look into the mirror, curious and clear-eyed, to greet the new life electric. ~ by Susan on 10/01/2011.